It's Friday! 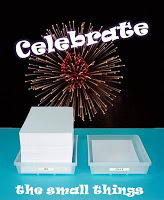 Let's Celebrate the Small Things with Lexa Cain! Tonja Drecker and I are her co-hosts. I just started working on a new short story this week. Since having baby Zoe, I haven't done much in the way of writing, and when the idea for this story struck me, I just had to give it a shot. It's going slow, but it feels good to get something written down nonetheless. The family is finally falling back into a normal routine. As fun as the holidays are, it's good to have some kind of return to normalcy. I'm certainly more productive while my boys are in school. I'm excited for a new year. I don't know what 2017 will bring, but I'm hoping for some good things. I'll definitely do what I can to make it a good year. Now that DH has returned to work after being on hiatus (laid off) I feel my routine is returning to normal and I do get a lot more done when he's not around. Not that I don't like having him here but you know how that goes - other things come up to do when you have someone around all the time. BTW, you'll now find my CTST contributions now on Thursdays, here, and of course, if you want to some more laughs you can check out Friday Sillies. Have a blessed, happy new year, my friend! Glad to hear you're writing again. Glad you have a new story in the works. The holidays are great but it is nice to get back to normal again. If there's a baby in my house, it must be me. I'm not writing this week because of blogging and a head cold. Okay, compared to having a newborn, that's just pathetic, isn't it? A new baby and a new story. It's all good! Yay to things getting back to normal! I thought the holidays would roll out this week here too, but then the school declared a week of snow days. Kids are thrilled though. Have a great new year! 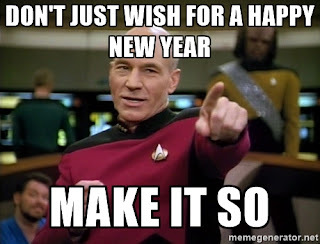 Happy New Year, live long and prosper with the writing! Yay for a new story and the family getting back to the normal routine! I sure hope 2017 is as Picard says: "Make it so." Have a great week! Meeting With My Muse Badge: Muse taken from a coloring sheet. Starry background courtesy of nuttakit at FreeDigitalPhotos.net. Globe courtesy of hisks at RGBStock. Tuesday Treat Badge: Green and purple background images courtesy of tinneketin at RGBStock. Daffodil courtesy of weirdvis at RGBStock. Butterfly courtesy of Zela at RGBStock. Cupcake courtesy of Zela at RGBStock. Worldly Wednesday Badge: Earth courtesy of ba 1969 of RGBStock. The alphabet courtesy of scolpix at RGBStock. Background courtesy of jscreationzs at FreeDigitalPhotos.net. Tea Time Badge: Cup courtesy of xymonau at RGBStock. Bottom horizontal and right vertical images taken from personal photos. Two topmost horizontal images on the left courtesy of TACLUDA at RGBStock. I'll Flash You Friday Badge: Lightning ball courtesy of cdw0107 at RGBStock. Left background image courtesy of sundstrom at RGBStock. Rightmost background image courtesy of vivekchugh at RGBStock.